Of all the ways to interject an unexpected flash of color or texture into your daily sartorial lineup, a fitted half-zip sweater is one of the easiest. And it's surely the warmest. Whether knit from merino, lambswool or cashmere, it will insulate without adding too much bulk. Which is helpful, as the best way to wear one is under a sport coat, blazer or suit jacket. The sweater got a bit of a bad rep thanks to dads and coaches mucking it up by wearing lumpy, ill-fitting versions over T-shirts. But when layered over a button down shirt and under a jacket, the effect is less "old fogey" and more "sporty Italian." Think Brunello Cucinelli—who, if you have the dough, offers one in orange cashmere for about $800. Here are some more realistic options. 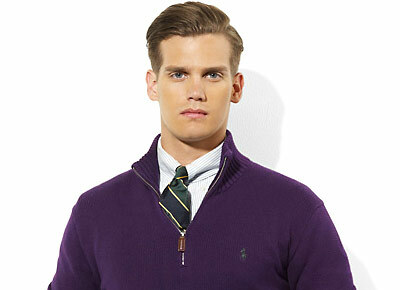 This is also a good alternative for guys not quite ready to pull on a turtleneck.